The vandalising of The Spear painting by artist Brett Murray has sparked heated interest and diverse reaction in the arts community. All he would divulge was that he had been asked by the Goodman Gallery whether they should seriously consider removing the painting due to the heated controversy. “I did suggest they should take it down,” he said. But filmmaker and chairman of Arterial Network South Africa Rehad Desai gave his context to the vandalism saying: “It’s good, very good. On Facebook people are signing a petition created by outspoken painter and illustrator Lizza Littlewort in response to the artwork’s vandalism. “This petition is an act of tolerance towards two artists who have defused a situation of toxic racial polarisation and potential violence,” said Littlewort. She added that in its new form, the work was making a statement about the rights of the individual to censor and was forcing the viewer to ask difficult questions about art, Jacob Zuma and life. 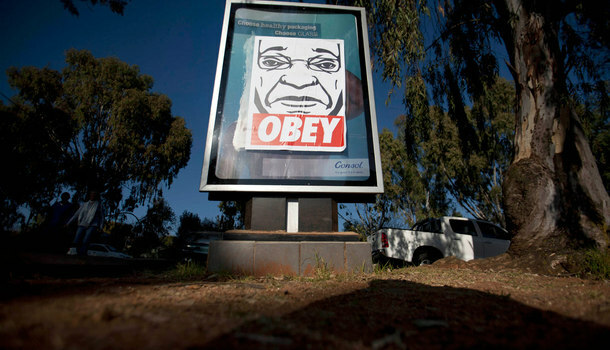 Creative director Honey Makwakwa questioned whether the artist had not benefited from this act. “When Marc Jacob’s store was defaced by a rebel artist, he photographed the mess and printed it on T-shirts that now retail for $350 (R2 884)! Savyra Meyer, illustrator and visual artist, said: “Defacing this work is another attempt by others attempting to gain publicity for their cause, whether it’s the brand of paint or some political party… who knows? “There will always be those who make the genuine courageous move, the true originals, and those who insist on riding on their coat-tails with their own agendas firmly in place. “If Brett Murray didn’t have the struggle credentials he did, then it could be seen as a stunt by an artist who knows how to increase his worth overnight by being controversial. “But I believe artists are prophets and need to speak truth to power because few others will, even if they do have the arena artists have. “Much as I didn’t like the painting because I believe like an African that everyone is still a person with a family, regardless of what they’ve done, and I cringe for Mr Zuma as a person, Brett Murray has shown a lot of courage.